The first snow of the season has yet to arrive in Coney Island, but the weather forecast says 70% chance of snow on Saturday night. 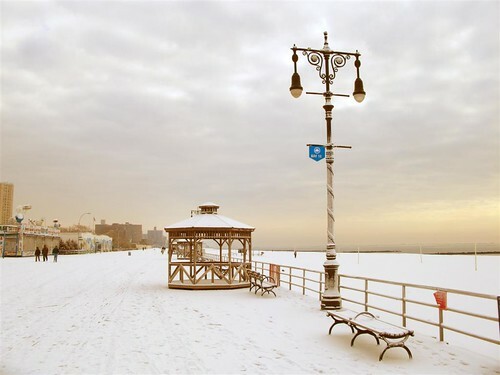 Coney Island resident and ATZ contributing photographer Bruce Handy/pablo57 sent us this exquisite image of a snowy day on the Boardwalk in January: “One of my favorite photos from last season. Ranked number 4 in my top 100.” It’s one of our faves, too. Have you noticed it’s already snowing on our blog? One of the “extras” for the holiday season on WordPress.com is animated snow. Our blog host has been doing this for the past two years. Amusing the Zillion debuted in April, so this is our first virtual snow. We’re enjoying it! Apologies in advance if anyone is inconvenienced. According to the instructions for “allowing” the snow, it can slow down the load time and eat up a lot of CPU on slower computers. There’s also a link for “preventing” the snow, if you choose. The snow is expected to end on January 4.